Being an artist, no longer dealing with beauty for Ali Ahmad. Through the spirit of art, Ali preached and provided employment around his home in Jepara, Central Java. Ali has been pursuing the world of calligraphy since 19 years ago. The series of writings from the verses of the Koran made Ali switch professions from relief art to calligraphy carving. "It feels like the calligraphy is beautiful. It can be seen, read, and contains elements of da'wah," Ali said at his residence in Demaan Village, Jepara City District, Thursday, January 31, 2019. Ali claimed the results of his work adorned a number of mosques in Indonesia. Some pesantren also buy their work. In 2009, Ali joined Inacraft's activities in Riyadh, Saudi Arabia. Ali brought 35 calligraphy in the activity. "It turned out to be sold out. Orders arrived from Riyadh for two years, not broken up. Orders from within the country also began a lot," recalled Ali, who now employs 15 employees. Besides beauty, Ali offers a lifetime guarantee for the calligraphy he made. If it is damaged, Ali can repair the purchased work. But if it can't be repaired, Ali will replace it with the same model and size. Ali is not stingy about science. The child of a fisherman who graduated from the Sunan Kalijaga Jogja IAIN in 1998 was willing to share the knowledge of making calligraphy with anyone. He shared knowledge for free. "It's my way to appreciate the curiosity of people with calligraphy," continued the father of three children. Ali offered one of his works ranging from hundreds of thousands to tens of millions of rupiah. 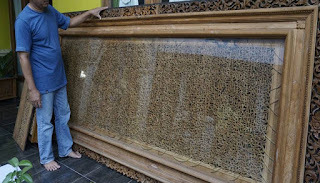 He made a pair of calligraphy carvings measuring 50 centimeters in size and bearing the name Allah and Muhammad up to the calligraphy art that read Surah Yasin measuring 2 x 3 meters. 0 Response to "Fishermen Become Exporters of Wooden Carving Calligraphy"